Believe it or not, Kitty really is an indoor cat. He just has this knack for sneaking out the door at unexpected times and making a run for it. He lives way out in the country, so once he gets out, there are real dangers out there that would scare any cat. So it is not surprising that each time Kitty has escaped, he has found himself up a tree. 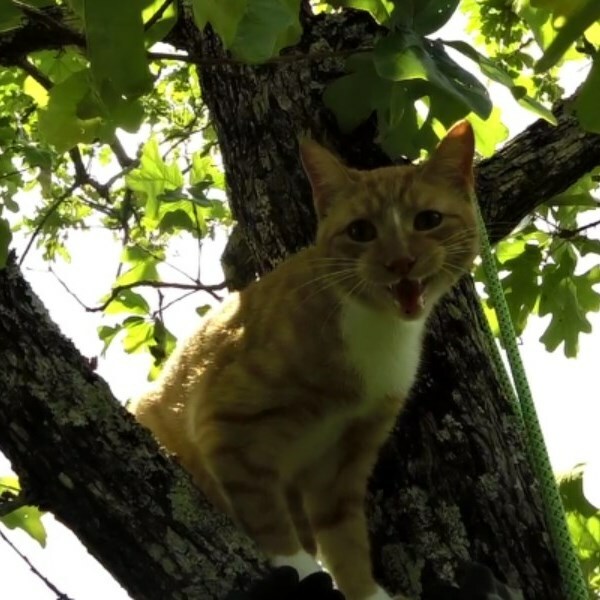 His owners, Austin and Erika, have tried so hard to keep him from escaping, and they have managed to keep him inside almost a year since he last escaped and climbed a tree. But Kitty is a devious boy, and he found a way to get out one more time. After Kitty escaped, Austin and Erika looked for him but could not find him. They looked in all the areas he has frequented in the past, but he was not to be found. They knew to look for him in the trees, and they called for him and listened for him to respond, but still they could not find him. They searched for him for five days with no luck, before something fortunate happened: their next door neighbor got his truck stuck in the mud. 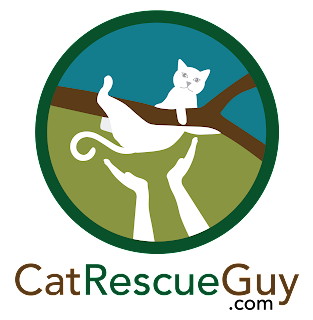 He was stuck in the mud because he found a cat stuck in a tree nearby and was trying to haul a ladder to the site to help. He didn't know it was Austin and Erika's cat; he only went to see them to ask if they could use their tractor to pull him out of the mud. And that is how Kitty was found. This is far out in the country, so the next door neighbor is not very close to Kitty's house. Plus Kitty was in a tree on the other side of the neighbor's house far away in a large wooded area. Fortunately, Kitty picked a tree right on the edge of the woods, so it was reasonably approachable for me. When I arrived, I found Kitty just over 20 feet high in an 80 foot pine tree which was very close to another twin pine tree of the same size. Running between them was an electric service line. The first time I rescued Kitty, he was not very afraid of me. He allowed me to get close to him, so I scruffed him into a bag and brought him down. For the second rescue, however, he was afraid of me and would not let me get close to him at all. I had to use my net on an extension pole to reach him. That rescue is still the only rescue I have done using the net. This image of him hanging on the rim of the net as I brought him close to me is still one of my most favorites. I didn't know what to expect this third time, but I was hoping for a more cooperative cat. But when I started preparing the rescue, I could hear the distress in his voice and knew he was going to be afraid of me again. With lots of pine tree above him, I knew he would likely climb ever higher as I approached him, so I was expecting a long rescue. I was right. Shooting a line up into the tree often scares the cats, and I was expecting Kitty to find it stressful as well. Indeed, even though I hit my small target perfectly on my first shot, Kitty reacted by vocalizing louder and moving around. He then turned and jumped over to the twin pine tree close by. The picture above shows him shortly after he jumped to the second tree and climbed a little higher. I debated abandoning my line in the first tree and starting over in the new tree, but suitable targets were hard to find in the second tree, and I knew there was always a chance that Kitty would jump right back to the first tree. I also thought it might be less stressful to Kitty if I climbed the first tree, keeping some comfortable distance between us. So that is what I did. As I climbed the first tree, Kitty did just as expected and climbed higher in the second tree. He always kept the distance between us the same, and that distance was substantial. I was hoping this would not continue all the way to the top of the tree, and I finally got a break when Kitty walked out on a limb at 60 feet high. While he was out on the limb, I took advantage of the opportunity to move my line over to his tree and climb up to his branch to keep him from going any higher. Now I had him trapped. In cases like this where getting close to the cat is not possible, then the rescue pole is my usual method for reaching the cat. But I wanted to try a less stressful method first. I opened a can of food and watched his reaction. He was interested but had no intention of moving to it. So I put the food in a long-handled food holder that I made to get it closer to him and farther away from me where he felt safer. Now he was more interested and was soon turning himself around and getting close to the food. I kept it there for him to think about, and it did not take him long to being eating from it. I let him have a few bites, and then I pulled it a few inches closer to me. He thought about it and then came a little closer. Then I got greedy and tried to pull even farther closer to me. He balked, so I put it back within his reach again and then lured him closer to me in smaller steps. Once he was just out of my reach, I pulled the food away and let him see me put it in a carrier. I put the carrier in front of him and he readily walked right on in. That was just what I wanted, and I was so happy to see that. I gleefully closed the door and brought him down. Austin took him home and released him inside. 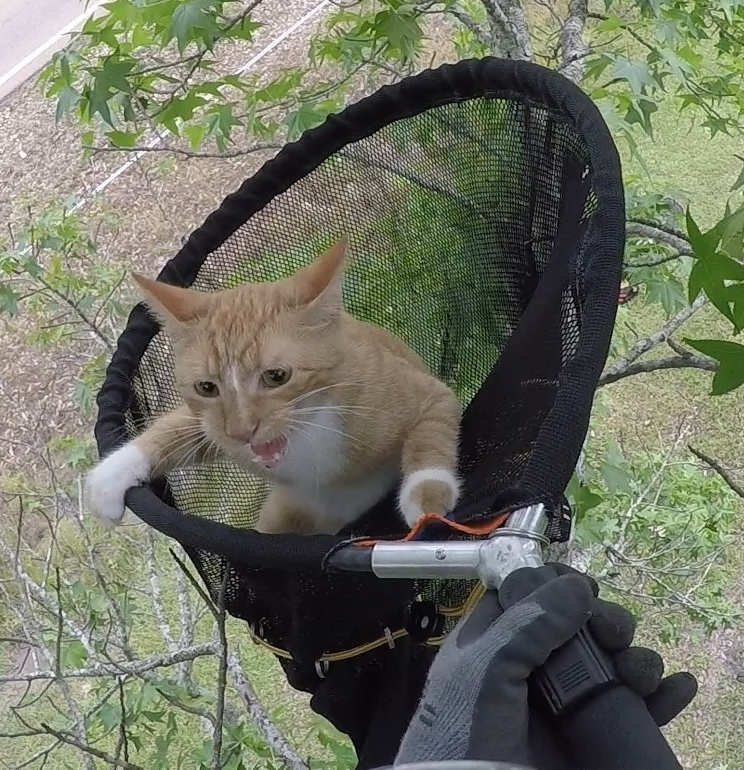 When I climbed the tree and first got in sight of Kitty, I reached up to my helmet to turn on my camera. The camera was not there. I had forgotten to bring it with me, and it was still sitting in my truck. I used to make blunders like this with my camera often and come away with no video to show. I have had better luck with that lately, but today that all changed. So I have no video or current pictures of Kitty to show, and except for the first image above, I had to resort to using his old rescue pictures this time. This one is from his first rescue when he allowed me to get close to him.